Be Warned! If you are planning to use wrap deformers make sure to TICK the box that says “Render influence objects” in the advance settings. 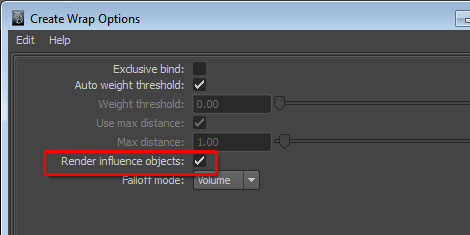 Otherwise you will find your low-poly object disappearing in thin air.. why on earth is this option unticked by default is beyond me, anyway if you need to hide the deform controller just do it in the attribute render stats..
Next 3Dcreative magazine – ya! hi, um do you have a solution for that in maya 8.5? it seems that that check box does not appear in the menu of maya 8.5…..
no idea, maybe check the render stats setting for the shape of the low poly. Thanks, that was driving me crazy.